Whether you've taken a fun "Try it! Renegade Encaustics" class with Tracy on a Friday night, or you've never taken an encaustic class before - or even if you have done encaustics with other instructors - this will be a great workshop for exploring Tracy's new and fun techniques! In this workshop, you’ll get your creativity literally "flowing" by working with the most luscious medium ever: hot melted beeswax. Are you wondering what encaustic is? It's creating art with melted, pigmented beeswax! This ancient medium is experiencing a major resurgence. Many students have taken Tracy's Renegade Encaustics classes over the years. Students love her novel approach to encaustics, with her out-of-the-box (or "renegade") way of creating art from this wonderful medium. Tracy has been teaching the short Friday evening “Try-It” classes for several years here at Cole Studio, but students always want more! So here it is: a FULL day of encaustics with Tracy! This workshop is an opportunity to experiment with not only a smorgasbord of encaustics, but also with all kinds of supplies and tools from ARTspot! 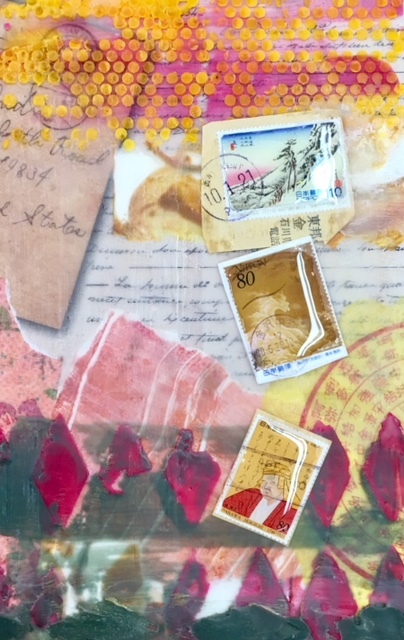 Not only are your boards AND encaustics AND resin included in the $50 supply fee, but also access to Tracy's stash of cool papers and 3-D objects you can incorporate into your art. Tracy will have two griddles set up with the melted beeswax, with demos all day long on techniques to build up layers and textures of colorful wax. If you have some special papers or ephemera objects you would like to bring, you are welcome to do so. Personalizing your art will make it even more special. However, you are welcome to "come as you are!" The combination of wax and resin is amazing and beautiful – and this class makes it super easy. You will leave with two finished projects to show your friends! ALL SUPPLIES ARE INCLUDED FOR THE $50 FEE! Supply fee paid directly to instructor. Cash or checks made out to Tracy Felix.